We are passionate about dentistry. We love what we do and it shows! Great attention is paid to every small detail from how you are greeted by our receptionist to ensuring your new smile looks great. This way you know that we are excited about our work and are happy to have you as a member of our “dental family.” Providing you with the highest quality dental work possible is our number one goal. This is the rule we live by. We know you’ll love our practice from the minute you walk through the door. 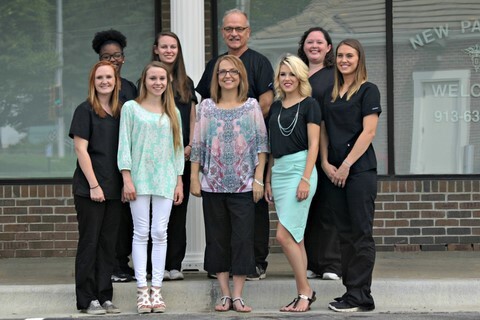 Unlike many other dental or medical offices you may have been to in the past, our staff is not just informative, we are friendly and caring! We want you to be comfortable and enjoy your time in our office. We are continually working to make things more convenient for you. Part of our focus on convenience is our early morning (7:00am on Mondays) and our evening appointment times (until 8:00pm on Tuesdays and Wednesdays and until 6:00pm on Thursdays). We also provide multiple on-line forms for patients to handle their needs before they ever arrive at the office, since paperwork is not on everyone's "favorites" list. You can also feel protected even when we are not in the office; Dr. Seaman has always provided 24 hour emergency dental care! Instructions on how to contact him after hours are always available on the office voicemail. Our newest additions to our administrative services include: our Patient Portal and text confirmations and reminders. The Patient Portal allows you to view your transaction history, your current billing statement, all future scheduled appointments for everyone on your account, and even make payments with your credit or debit card. We also added LIVE CHAT to our website in January 2016 - it is not available 24 hours a day, but we are trying to increase the availability to include before and after the office opens and closes and even more time on the weekends, to help you with questions or scheduling appointments via chat! If you don't have time to contact us by phone or it is outside our normal office hours, you can still contact us about scheduling or with any questions you have and we will contact you as soon as we return to the office. In fact, our main email box is checked multiple times throughout the day, even when the office is not open, to help improve our response to your needs. resolver el problema para a mediados de septiembre 2016. If you are not currently receiving our office newsletter and you would like to start Sign Up Now. Born in Vandalia, Illinois, Robert J. Seaman, Jr., D.D.S. spent most of his childhood in Florisssant, Missouri. He received a Bachelor of Arts Degree in Biology from the University of Missouri - Columbia in 1976 then enrolled and graduated from the University of Missouri - Kansas City School of Dentistry, earning his Doctor of Dental Surgery Degree in 1981. Dr. Seaman graduated with honors and was elected to Omicron Kappa Upsilon Dental Honor Society. Immediately following graduation in 1981, Dr. Seaman opened the doors to his dental practice. While he was building his practice, he was also an assistant Professor of Clinical Dentistry at UMKC Dental School, teaching in the Crown and Bridge Department from 1981 to 1990. Dr. Seaman enjoys all aspects of general dentistry, with a special interest in crowns, bridges, and cosmetic related dentistry. He feels this is an artistic outlet for him..... creating smiles. He continually enhances his education with new and better procedures in crown and bridge, endodontics (root canals), orthodontics and TMJ (jaw alignment) treatment to better serve all of his patients. "It has always been my goal to provide as many services as possible to my patients, so they would not have to be referred all over town for dental care," he explained, "while there is a time to involve a specialist, most of a patient's needs can and should be provided by their family dentist - so this is what I have done through the years." As a result, Dr. Seaman and his office, provide routine preventive and diagnostic services, periodontal (gum disease) care, fillings, crowns, fixed bridgework, removable dentures, fixed dentures, porcelain veneers, in-office and at-home whitening services, root canals, emergency care, bonding, non-surgical treatment for TMD (TMJ) conditions, restorations over implants, and even orthodontics; including appliance therapies, full braces (in metal and porcelain), and invisible (aligner therapy) braces. Besides all he does to improve his patients' dental experiences, Dr. Seaman also has a large family to keep him busy. He and his wife have 6 grown children and 5 grandchildren, which is one of the reasons he understands how busy families can be and why it is so important to him to maintain an office schedule which is accommodating to both professionals and families. Outside of the dental office, Dr. Seaman is also an avid woodworker and received his Master Woodworker certification at Marc Adams School of Woodworking. He not only builds beautiful furniture and accents for his home and children, he also brings his talents into the office. Just recently he added custom built cabinets in the office, some cement countertops and a cabinet for the new fish aquarium in the reception area. He is currently working on building new cabinets for each of the patient rooms, as well. If you have any questions you would like to ask Dr. Seaman directly, send him an email. Having trouble with any of our website features? Voted 2015’s best Dentist in Lenexa for Dentistry treatment and services as reviewed by patients. © 2015 Seaman Family Dentistry, PA. All Rights Reserved.